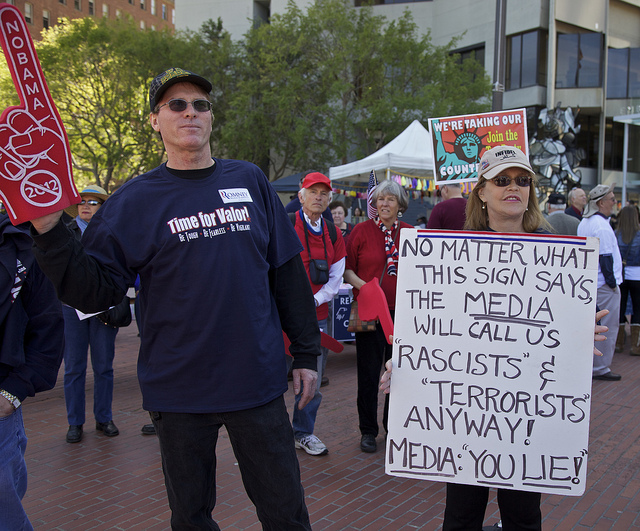 Almost two years ago, I posted Teabonics: More Reasons to Fear the Teabaggers, yet another in my series of photos of Tea Party rallies. While most of the posts were aimed at pointing out racism and violent rhetoric, my Teabonics post took a more humorous look at the Tea Party. Well, I guess the media might be lying if it called these folks “rascists”. How hard is it really to have correct spelling on your poster? I guess I’m not sure why this guy is upset that our elected leaders are not betraying American citizens. Does he wish that they were? Odd point of view for a Tea Partier. Repeat after me: Q is followed by U, Q is followed by … oh, never mind. And just out of curiosity, why do you suppose that this fellow thinks that President Obama is “sqatting”? Might it have anything to do with, oh, I don’t know, the fact that he he doesn’t think President Obama is a natural born United States citizen who is eligible to be President? Remember, there’s no “rascism” in the Tea Party. Update November 29, 2012: Repaired dead link and formatting irregularities. And then there's the "sports version" of all this nonsense........TEBOWING!! Great write up as usual. My question is in reference to the sign behind the misspelled sign. Just who or what are they wanting to "Take our country back" from or to???? Too bad you didn't find one of my personal favs. I love when they hit a solid triple with the Obama is a Socialist Fascist Communist! Makes me laugh every time.